We’re inching ever closer to the 2019 season, and there are just so many pitchers to talk about. Therefore, this week I’m cheating and doubling up in my Reality Check! Is it really cheating if it’s your own premise that you can technically do whatever you want with? Let’ say yes, so that I can feel like a vigilante. Eat your heart out, Arthur Morgan. 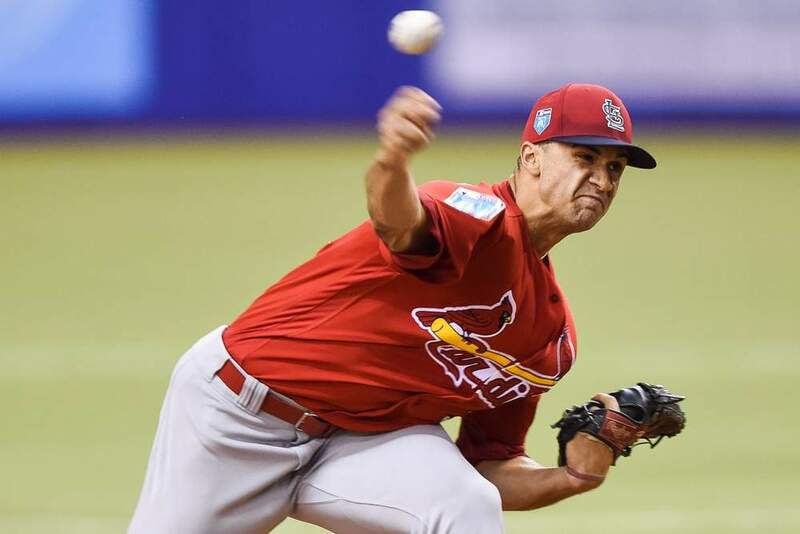 Jack Flaherty tossed 151 glorious innings as a 22-year-old with the Cardinals last season. While his strikeout rate (10.85 K/9) and ERA (3.34) were ace-level, his walk rate (3.52 BB/9) left us wanting more. The league adjusted to him a bit over the second half, as his first-half ERA rose from 2.93 to 3.67 over the second half. So should we expect more regression or a step forward from the young righty? Flaherty’s pitch mix is a quick way to establish the foundation of his value. He has four pitches he throws with confidence: a four-seamer, sinker, slider, and curve. He occasionally throws in a changeup against lefties, but it’s not a real weapon for him. The slider is what butters his bread, and if you’ve ever seen one of his starts, you know this already. He threw it 29 percent of the time in 2018, earning 24-percent whiffs while allowing just a .181 BAA. It did allow a .176 ISO, however. It’s a great pitch, but it was also part of the reason he had a bloated 15.2% HR/FB – it induced just 37% ground balls. The real issue with Flaherty is the walk rate, and it’s a problem that may persist. His first-pitch strike rate was 57.2%, which clocked in as the 11th worst mark among starters with at least 150 innings pitched. Of course, as I mentioned in my Sabermetric Series, this metric isn’t everything. You could look at that leaderboard and see Blake Snell right next to Flaherty, and all he did was win the AL Cy Young. He’s also a lefty with better velocity and a deeper repertoire, so comparing them based on one stat is ridiculous. Even without much of a changeup, Flaherty was able to avoid platoon splits. While that is very positive, there are other negative factors to consider before taking the plunge on Flaherty. His .257 BABIP and 79.3% strand rate are very likely to regress. That fed into his 2018 FIP of 3.86, which is still decent but not so ace-like. His HR/FB rate also may not regress unless he improves his command of the slider. His current draft price of SP18 is probably about right. It bakes in some regression but also considers his high strikeout floor. Whether he takes a step forward or backward depends largely on his control. Is Robbie Erlin A Sleeper? West coast players who aren’t on the Dodgers occasionally tend to get overlooked. A lot of their games go into the wee hours of the morning on the east coast. By that time, most of those people have been sleeping soundly for hours, dreaming of east coast things like clam chowder and ringing the Liberty Bell with a six-foot cheesesteak. When one of those west coast players is a starter who posted a middling 7.27 K/9 and 4.21 ERA, you have yourself a pitcher no one really cares about. He wouldn’t be a sleeper if there wasn’t a little mange to the dog though, would he? Offsetting the deafening mediocrity of the K-rate is a crazy-good 0.99 BB/9 that didn’t diminish when he moved to the rotation. He was also averaging over 91 MPH at the end of the season, a full tick above any season he had posted previously. Perhaps the TJS actually helped in that regard. He had a few other tricks up his sleeve as well, debuting a sinker and a cutter for the first time in his career. The cutter shows up merely as a blip because he waited until September to unveil it. It’s a small sample, but overall it was an above-average pitch. He used it 15% of the time in September, earning a 13.79% whiff rate with 53% ground balls, and a .158 ISO. The sinker was less exciting but still solid, inducing 7.6% whiffs on the year with 49% ground balls and a .148 ISO. The premier asset here is Robbie Erlin’s changeup. It’s sort of a shame he used it less than any other season since 2013 at 16% because it earned 15.56% whiffs, a 56% ground ball rate, and minuscule .064 ISO. He dropped the usage a bit to incorporate the sinker and cutter to pair along with a curve and seldom used slider (used against lefties, which appears to be different than the cutter based on vertical movement and velo gap). 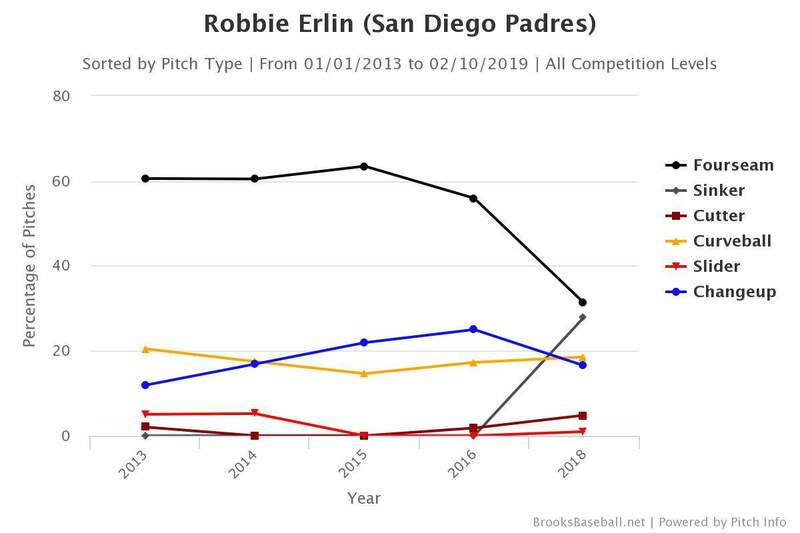 The makings are here for Robbie Erlin to enjoy a sort of Miles Mikolas-type of a breakout season. He won’t light the world on fire with a sizzling K-rate, but he can paint the corners of the strike zone and burn through innings efficiently because he simply doesn’t issue free passes. The aforementioned 0.99 BB/9 was the best in baseball (min. 100 IP), putting Mikolas’s second-place mark of 1.30 BB/9 to shame. His ERA may have been 4.21, but with a normalized strand rate (his was 62.5%) his FIP put him at 3.21. If you want to continue down that road, his xFIP was 3.41 and his SIERA was 3.52. I’d expect the Padres to let him fly for 150 innings this year, but I don’t feel comfortable projecting beyond that. I just don’t know how strict the Friars will get with his workload in his second year off TJS. Still, I see a way under-drafted starter (ADP SP 142!!) who can post a low-to-mid threes ERA along with a strong WHIP. The investment here is almost nil, so if the new pitch mix doesn’t work out, you won’t lose sleep cutting him. Enjoying Nathan’s takes on Jack Flaherty and Robbie Erlin? For more great rankings, strategy, and analysis check out the 2019 FantraxHQ Fantasy Baseball Draft Kit. We’ll be adding more content from now right up until Opening Day!